Wounded Warrior Project (WWP) shares a special, lasting bond with legendary Def Leppard drummer Rick Allen. In 2009, Rick met WWP National Service Director John Roberts, and they joined forces to reduce the stigma associated with post-traumatic stress disorder (PTSD) for wounded veterans, and for citizens alike who’ve lived through traumatic experiences. Because of the years working together to raise awareness of PTSD, and the countless hours Rick has dedicated to helping others for this cause, WWP is thrilled to learn that Def Leppard is a 2019 Rock and Roll Hall of Fame inductee. Rick’s PTSD stems from a car crash more than 30 years ago. He was thrown through his vehicle’s sunroof, severing his left arm. He overcame that injury to rejoin his band the following year. But the wreck haunted him. John suffered third-degree burns during a helicopter crash 25 years ago while serving his country in the United States Marine Corps. Through these very different experiences, they formed a bond to help others heal. 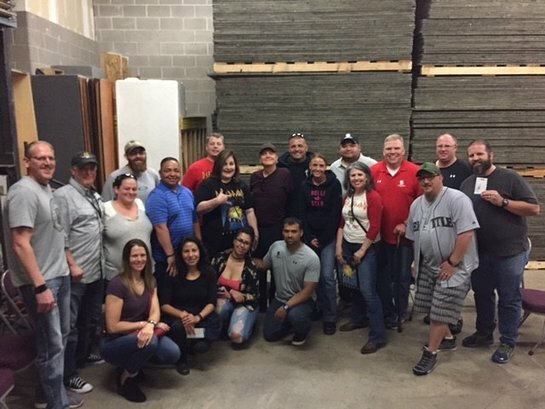 Rick has dedicated time to join WWP, meeting with warriors during program events such as Project Odyssey – the first part of a 90-day mental health program within WWP’s Combat Stress Recovery Program – and has invited warriors backstage before concerts to discuss PTSD in a group environment. Through Rick’s Raven Drum Foundation, he created Project Resiliency to help further dilute the inaccuracy that PTSD is only an issue for veterans. To help warriors with PTSD, click here. To learn more about connecting with WWP’s Combat Stress Recovery Program or Project Odyssey, click here.